Pitch Pitch is the distance between groove centers and is measured on the pulley pitch circle. On the belt, pitch is the distance between tooth centers and is measured on the pitch line of the belt. 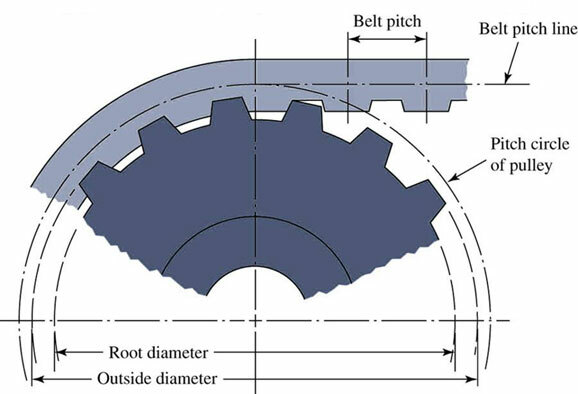 Pitch Diameter Pitch or datum diameter for a pulley is the diameter of the line of action. 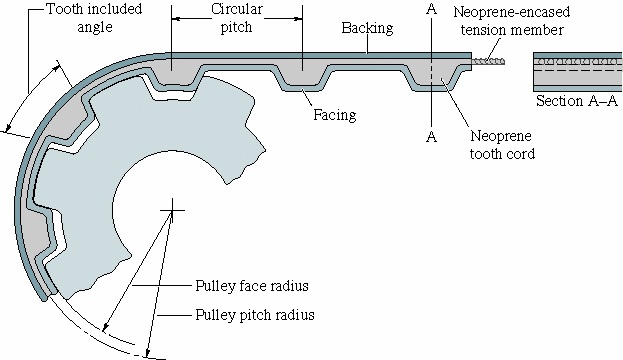 Typically it is at or near the center of the circular pulley groove. Outside Diameter Full diameter to outside of flanges. The pitch you choose will depend on the application’s load and speed. Timing belts must be run with timing pulleys of the same pitch. When running sets of pulleys the smaller pulley of the set is usually flanged. If three or more pulleys are in a drive, every other should be flanged. A pulley’s pitch diameter will always be greater than its outside diameter. Timing pulleys have evenly spaced axial grooves in order to make correct positive engagement with the mating teeth of the belt.